I did think to myself that I’d try and write this whole review using puns, but I’d be nuts to. That’s the first and last, I promise. 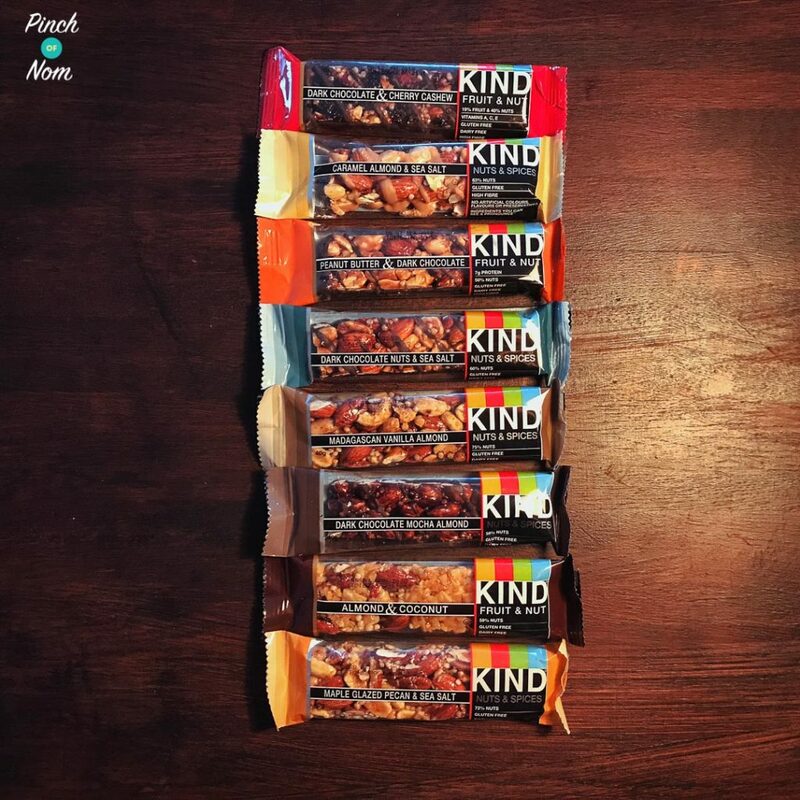 What we have here are the nutty, chocolatey fruity based bars from Kind. There’s not a whole lot of things to say to introduce them to you, other than the fact that, on first impressions, they are PACKED with nuts. I’m quite interested to test these out; I’m a lover of some nuts and others I’ll avoid at all costs, so my personal test is to see how these will fare to my pickiness. What do the Kind bars taste like? As you can see I’ve had a very wide selection of flavours to try! Disclaimer, I really dislike coconut, so I’ve given that one a miss. The others I’ve had a good try of. What do they taste of? 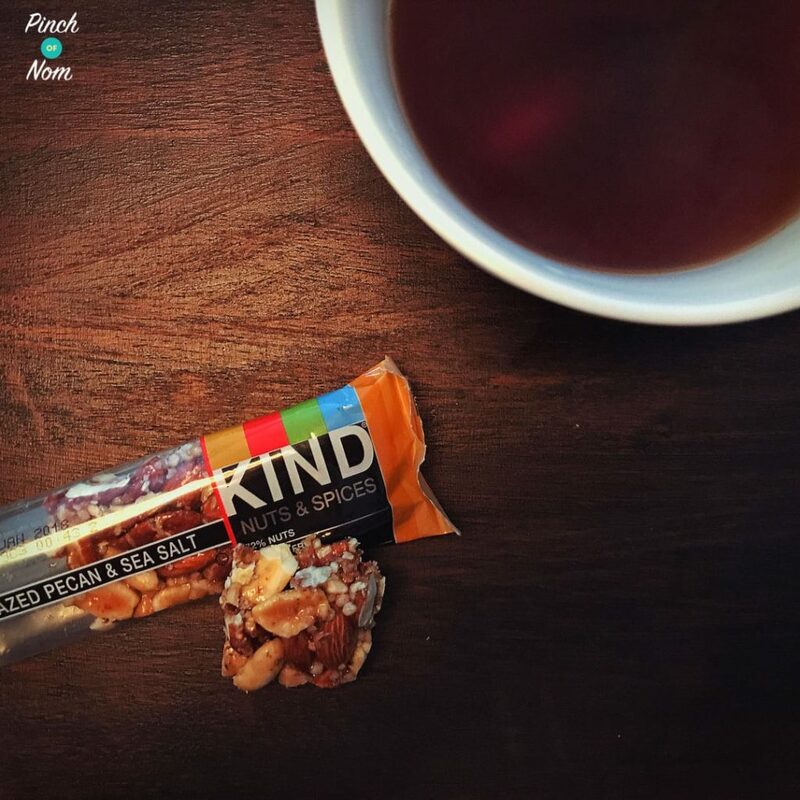 If you are a complete nut lover then you will really enjoy tucking into a Kind bar. 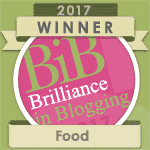 They’re packed full of flavour, seasoned with salt and the specific flavour attached to the bar. Loads of crunch and naughty chocolate stringing through some of the flavours make them a complete assault on the senses. These are not a half hearted attempt at a nutty bar, these are an absolute nut extravaganza. The different flavours all work really well, some sweeter than others, some with a definitely salty element which works really well. My personal favourite is maple glazed pecan and sea salt, exactly what it says on the tin and more. How many Syns are in Kind Bars? 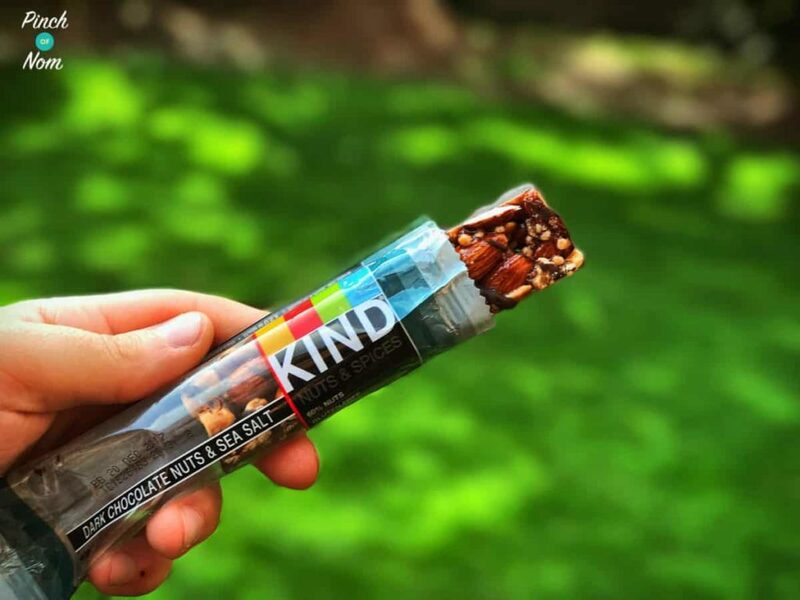 Kind cars range from 8.5 syns (for the Dark Chocolate & Cherry Cashew) to 10.5 syns (for the Maple Glazed Pecan & Sea Salt), which on the face of it is quite high for a small, sweet snack. 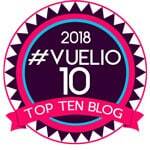 This is dependant on how you like to use up your syns. If you’re one who spreads them out through every meal then these aren’t for you. This is for the one hit Synful wonder at the end of the day, when you’re looking for your sweet hit. When you bite into a bar, it doesn’t feel like a diet bar, or something that’s ‘good for you’. It feels decadent, a complete luxury. You might even think how they’re quite so low considering how they taste. These aren’t small bars either, they’re a ‘proper’ size. 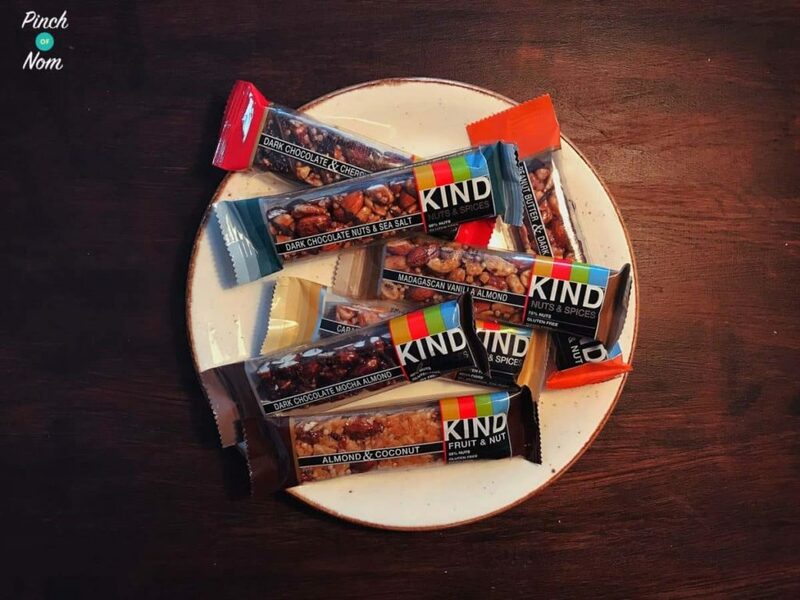 Kind bars are available in Tesco, Sainsbury’s, Waitrose and Co-op stores. They’re also available from Amazon and Kind’s own website in larger packs. Priced from around £1.29 for an individual bar, and available in packs of 12 on Amazon for around £15. Would I buy Kind Bars again? To know that I can buy an individual bar out and about from the supermarket and know I’m not going to be short changed on a sweet, nutty bar is a good excuse to purchase again. As I’ve said, these are thoroughly nutty, they are not a chocolate bar with nuts in them, they’re a nut bar with a bit of chocolate. That makes them sound inadequate. If you’re a fan of a nutty bar then you need not look further. Healthy eating or not, these are a go-to for nut lovers far and wide. I’ve just been given a free one at Holborn station in London. I got the ‘dark chocolate nuts & sea salt’ so I jumped straight on google to find the syn value. I dont think you mentioned the syns for this one so I’ll say 10.5 and call it a day. Looking forward to having half for my 11am snack and maybe half for the 3pm munchies. It must be a new flavour! You could hang on to the wrapper and email Slimming World to get the accurate syn value. Thanks for getting in touch, enjoy the bar! Caramel almond and sea salt is amazing. Not sure if the values though. 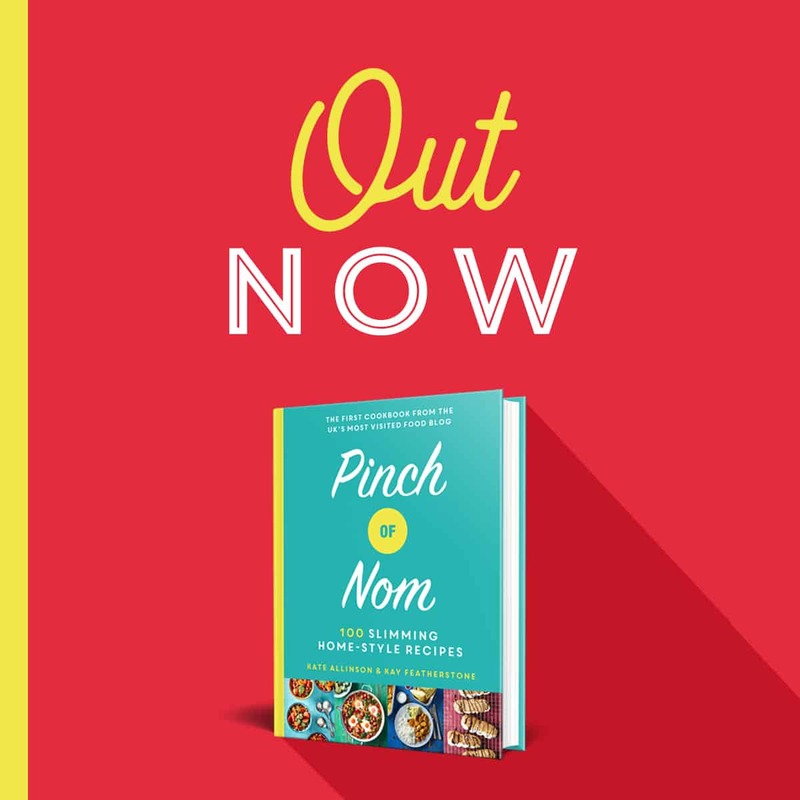 You’d need to contact Slimming World for Syns info! Thanks for getting in touch.